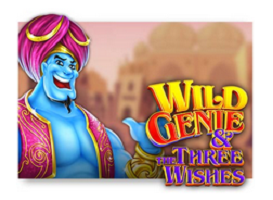 Wild Genie and The Three Wishes slot is pretty much based on the popular tale of Aladdin. There is the special Wild Genie that appears in a rather large form on your fist reel and spreads some Wild Magic. This special little feature only occurs during the base game. Wild Symbols that are played during the base game substitute for all symbols other than the Red, Green and Blue Magic Lamp Symbols. Once in the Free Game Feature, the Wild Symbol, substitutes for ALL symbols. There are three different coloured lamps. You will need to collect one of each to trigger the Free Spin Feature. As you collect these lamps you can store them. As soon as you have one of each the Free Game Feature then comes into operation. While collecting however if you do not have a full set you have the option to store or Spend your Lamp. When you Spend the Lamp, the Genie will grant you a Bonus. A Magic reel will reward you with 1 of 4 Bonuses. 1. Lock & Spin. Spin 15 mini reels o reveal open Scrolls with Multipliers inside. These Multipliers are then locked into place and blank reels re-spin. Spins continue until there are no new multipliers appearing. This bonus rewards anywhere from 1 – 100 times Multiplier. 2. Multiplier. A Wheel of Fortune will appear awarding a total bet multiplier of up to 100x. Click the Spin Button to determine your reward . 3. Click Me. Choose 1 of 5 Treasure Chests to reveal and collect your bet multiplier. Rewards rand from 5 x multiplier to a maximum of 50 x multiplier. 4. Win Spin. Slot reels will be filled with several duplicate symbols. Click the Spin button and the Win Spin Bonus guarantees a minimum of 3 x 3 win Block with an additional chance to match fourth and fifth reels. To determine your spins you will need to choose from 3 Free Spin Modifiers. You will first choose your Multiplier which could offer you a multipliers of up the 3 x. Secondly you choose the number of Spins which could be up to as many as 20 Free Spins. Lastly you get to choose your Modifiers. There are three different Modifiers which could be won during the Free Spin Bonus. 1. Expanding Wilds. These speak for themselves in that they expand vertically on the reel to give possible winning combinations. These symbols are only present on the second, thirds and fourth reels. 2. Semi-Sticky Wilds. Wild Symbols are present on all reels. Landing on a Wild Symbol will make it sticky for a predetermined number of turns. Semi-Sticky Wilds will continue to spin the reels even if there are no spins remaining and no wilds in view. 3. Walking Wilds. These Wild symbols become present on reel 5 only. It is at this stage the Walking wild will move from Right to Left with every Spin until if walks off the first reel. Each time you receive or a Sticky Wild lands on reel 5 this procedure will continue. This entry was posted in Casino Games and tagged Play Wild Genie and the Three Wishes Slot at Slotsmillion, Wild Genie and the Three Wishes Slot Review on April 15, 2019 by Casino Admin.